Kelli Russell Agodon is the author of two books of poems: Small Knots and the chapbook Geography. Her work has been published in the Atlantic Monthly, Prairie Schooner, Notre Dame Review, North American Review, Crab Orchard Review and Image. Her work has been featured on NPR's The Writer's Almanac with Garrison Keillor and in Keillor's second anthology, Good Poems for Hard Times. 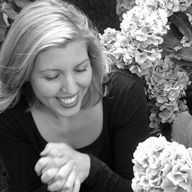 Born and educated in the Pacific Northwest, Kelli is a graduate of the University of Washington and Pacific Lutheran University's Rainier Writers Program where she received her MFA. Currently, she edits the literary journal Crab Creek Review. Most people are mistaken that they are separate beings although they are one, Lakshmi. the parasitic twin on the back of a swan. but a goddess in the eyes of her town. the witches' butter instead of treasure. gold coins flowing from her hands. so she can live a better life.